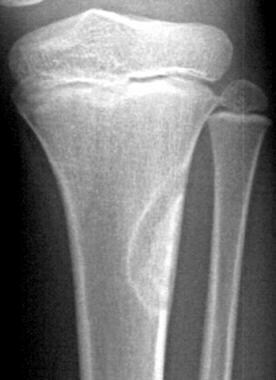 Frontal radiograph in a 9-year-old with trauma to the left knee shows a well-defined, cortically-based lesion with sclerotic margins, situated on the lateral aspect of the left upper tibial metaphysis. The lesion has the typical appearance of a fibrous cortical defect. Enneking stage 0. Frontal radiograph in a 10-year-old boy with pain of the left upper limb shows a well-defined, loculated, centrally located lesion in the left humeral metaphysis. Overlying cortical thinning is noted. The lesion has the typical appearance of a unicameral bone cyst. Enneking stage II. Computed tomography (CT) scan of the lungs shows multiple lung metastases (white arrows) and bilateral pleural effusions (black arrows) in a patient with osteosarcoma of the humerus. Enneking stage III. The Enneking system for the surgical staging of bone and soft-tissue tumors is based on grade (G), site (T), and metastasis (M) and uses histologic, radiologic, and clinical criteria. It is the most widely used staging system and has been adopted by the Musculoskeletal Tumor Society. [12, 13, 14, 15] The system should be reserved for staging mesenchymal lesions rather than nonmesenchymal ones (such as the lesions of Ewing sarcoma, lymphoma, and leukemia), because the biologic behavior of nonmesenchymal tumors differs from that of mesenchymal lesions. For example, studies have shown that the site of occurrence of Ewing sarcoma is not a significant factor when tumor size is considered. Surgical grade generally follows histologic grade; however, a higher surgical grade may be applied if the radiographic features and clinical behavior of a lesion indicate an aggressiveness that is incompatible with its benign histologic features. Under the Enneking system, malignant tumors are classified into stages I-III, with further subdivisions into A and B. Grade 1 and grade 2 tumors are stage I and stage II, respectively. T1 and T2 tumors are stage A and stage B, respectively. Tumors with distant metastasis are stage III (see Table 1 below). The aims of limb salvage surgery are to cure disease and to preserve limb function for the patient. The aims are usually achieved by using a combination of limb salvage surgery and adjuvant therapy. The tumor is situated in the extremities and/or the axial skeleton. The tumor margins are amenable to surgery. Only moderate soft-tissue extension is present. The neurovascular bundles are intact. Metastases are absent or amenable to curative treatment. The patient is in good general health. Regarding resection margins, optimal surgical margins are 6 cm of healthy bone around the bone margins and 2 cm of healthy soft tissue around the soft-tissue extent of the tumor. If a malignant tumor is responsive to chemotherapy, smaller resection margins may be acceptable. Stage 1 tumors - Intracapsular excision (or curettage) is adequate. Stage 2 tumors - Extracapsular excision passing through the reactive zone is needed. Stage 3 tumors - Wide margins of resection are required in stage 3 lesions (aggressive benign tumors). In areas that are not amenable to wide excision, marginal excision together with adjuvant treatment (eg, radiation therapy) may be acceptable. Stage IA - These tumors are treated with wide excision and are usually amenable to limb salvage procedures. Stage IB - Such tumors may be treated with wide excision, but the choice between amputation and limb salvage depends on the estimated amount of residual tumor left behind after a limb salvage procedure. Stage II - These tumors are high grade, are usually extracompartmental, and have a significant risk for skip metastases. They usually are not amenable to limb salvage operations and require radical amputation or disarticulation in most patients. However, bone tumors responsive to chemotherapy may be treated successfully using wide excision and adjuvant therapy. Stage III - Tumors at this stage are responsive to chemotherapy and may be treated with aggressive resection. Those that are not responsive to adjuvant therapy should be treated with palliative resection. Frontal radiograph in a 16-year-old girl with pain in the right upper limb shows a metaphyseal lesion with ill-defined, permeative destruction. Cortical erosion and a Codman triangle are seen (arrow). These are the radiographic features of an aggressive lesion that was proven subsequently to be osteosarcoma. Enneking stage IIB. The grading system developed by Lodwick and coauthors groups lesions into 3 grades. In the staging of bone tumors, computed tomography (CT) scanning has a role in the detailed evaluation of local disease and in assessing the lungs for pulmonary metastases. 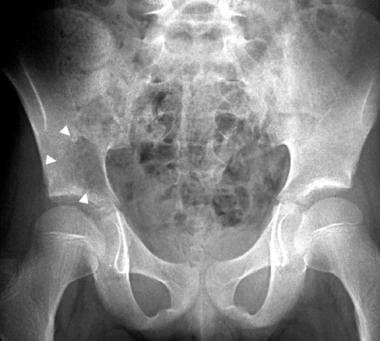 Frontal radiograph in an 11-year-old girl with back pain shows an ill-defined, lytic lesion in the right iliac bone, just above the acetabulum (arrowheads). The lesion was proven to be a Ewing sarcoma. The Enneking staging system is not used for nonmesenchymal lesions such as Ewing sarcoma. Computed tomography (CT) scan demonstrates the characteristics of a lytic lesion, such as destruction of the thin, overlying cortex (arrow) of the right iliac bone. CT scans have been shown to be more accurate than chest radiographs in evaluating the lungs for the presence of metastases. However, CT scans may produce false-positive results when small lung nodules are detected. Follow-up CT scans are useful in monitoring the nodules. Obtain magnetic resonance images before performing a biopsy. Position the patient comfortably to minimize motion artifacts. Sedation is often required in children. Place a vitamin E or cod liver oil capsule over the site of interest. Perform the imaging in at least 2 planes. Perform conventional T1-weighted and T2-weighted, spin-echo sequences because they provide reproducible images. Typically, pathology appears as areas of low signal intensity on T1-weighted images and as areas of high signal intensity on T2-weighted images. Osteosarcoma of the right humerus. 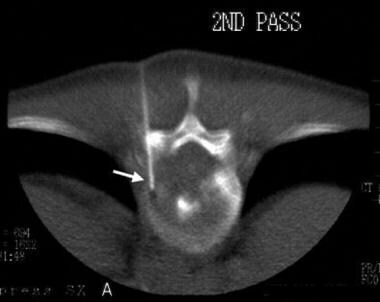 Fast spin-echo, T2-weighted, coronal magnetic resonance image shows a large, metaphyseal-based lesion of mixed signal intensity with a large, soft-tissue component (arrows). Enneking stage IIB. Short T1 inversion recovery (STIR), coronal magnetic resonance image shows the lesion's extent and a large, soft-tissue component. Enneking stage IIB. The intravenous administration of gadolinium diethylenetriamine penta-acetic acid (Gd-DTPA) increases the signal intensity on T1-weighted images by reducing the T1 relaxation time (see the images below). This feature is useful in distinguishing necrosis from an active tumor and in differentiating cystic lesions from solid lesions. Although some authors have indicated that MRI contrast agents do not improve tumor detection or staging accuracy, most authors have found that the administration of MRI contrast agents is useful in making difficult diagnoses. T1-weighted, fat-saturated, axial magnetic resonance image demonstrates the lesion and its soft-tissue component (arrowheads). Enneking stage IIB. T1-weighted, fat-saturated, axial magnetic resonance image acquired after the intravenous administration of gadolinium diethylenetriamine penta-acetic acid shows marked enhancement and increased signal intensity in the lesion and its soft-tissue component (arrowheads). Enneking stage IIB. In many cases, MRI cannot provide a histologic diagnosis of soft-tissue lesions. However, some lesions have appearances that are usually characteristic enough for a histologic diagnosis based on the MRI findings. Examples of such lesions include lipomas, superficial and skeletal muscle hemangiomas, benign neural tumors, periarticular cysts, hematomas, and pigmented villonodular synovitis. 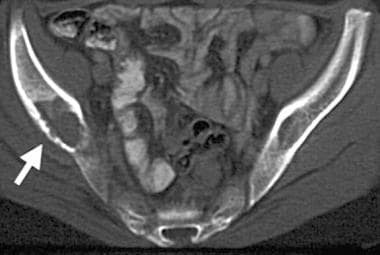 The most common soft-tissue lesions diagnosed with MRI are lipomas. They appear well circumscribed, homogeneous, and isointense relative to subcutaneous fat on images obtained with all pulse sequences. Thin, low-intensity septa also are sometimes seen in lipomas. Tumor tissue is usually low in signal intensity on T1-weighted images and high in signal intensity on T2-weighted images. The mineralized matrix is seen as areas of low signal intensity on T1-weighted and T2-weighted images. Areas of hemorrhage are seen as areas of high signal intensity on T1-weighted and T2-weighted images. The measurement of T1 and T2 relaxation times are useful in determining the histologic features. The imaging criteria that are used in differentiating benign from malignant lesions on radiographs and CT scans have been applied to MRI. Typically, benign lesions are well defined and sharply demarcated from the surrounding healthy tissue. Malignant lesions are typically more extensive and involve surrounding tissue to a greater extent than do benign lesions. However, MRI signal intensity alone is not reliable in distinguishing between benign and malignant tumors. MRI is the modality of choice in assessing local spread of tumor (Enneking sites T1 and T2). MRI can help in accurately detecting tumor involvement of neurovascular structures, muscle compartments, growth plates, and joints. MRI is accurate in determining involvement of the neurovascular bundle (see the image below). MRA may provide additional information regarding neurovascular bundle involvement. MRA can help in assessing peripheral vascular branches and tumor neovascularity. By demonstrating treatment-induced changes in tumor neovascularity, MRI may also help in assessing a tumor's response to treatment. Fast spin-echo, T1-weighted, axial magnetic resonance image obtained with fat saturation and the administration of gadolinium diethylenetriamine penta-acetic acid, in a 13-year-old boy with osteosarcoma of the left distal femur. The image shows enhancing tumor tissue that extends circumferentially into the surrounding soft tissues. The distal femoral vessels are almost involved (arrowheads). 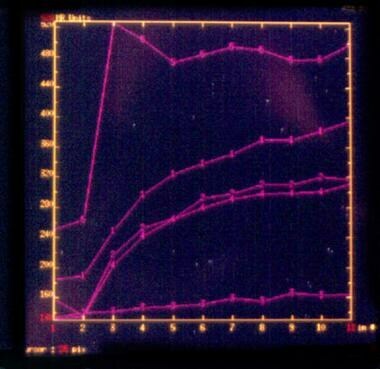 Enneking stage IIB. 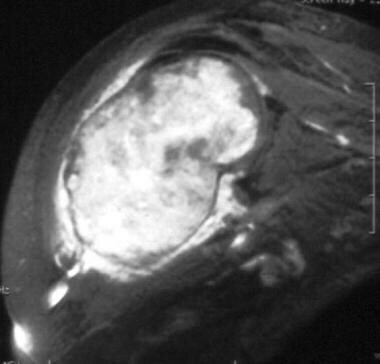 Although MRI usually accurately depicts the intramedullary spread and soft-tissue extension of a tumor (see the image below), differentiating tumor edema from true tumor spread may occasionally be difficult. Typically, edema is seen as an ill-defined, homogeneous, hyperintense area with a featherlike appearance. Edema tends to follow the tissue planes; it has no mass effect, and unlike the distinct pseudocapsule of tumor tissue, it possesses a fading margin. The administration of Gd-DTPA also aids in the distinction of tumor tissue from tumor edema, because tumor tissue enhances and edema does not. Intramedullary spread and soft-tissue extension of a tumor are more accurately assessed with MRI than with CT scanning. 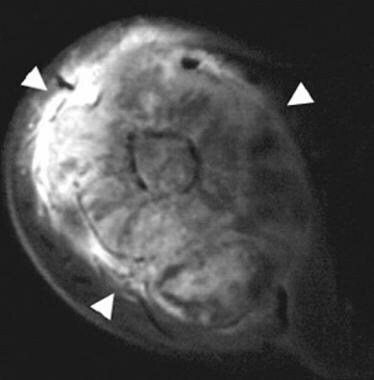 Fast spin-echo, T2-weighted, coronal magnetic resonance image with fat saturation demonstrates the presence of a tumor within the medullary cavity (small arrow) and extending to the midshaft of the femur (large arrow). Soft-tissue tumor extension is shown (arrowheads). Enneking stage IIB. The accuracy of MRI in the evaluation of joint involvement is controversial (see the image below). Some authors have found MRI to be more accurate than CT scanning in demonstrating joint involvement, although Bloem and colleagues found that CT scanning and MRI provided similar results in their study. Enhancement of joint synovium after Gd-DTPA administration may mimic tumor involvement. Joint effusion alone is not diagnostic of tumor involvement. Fat-saturated, T1-weighted, contrast-enhanced, coronal magnetic resonance image in an 8-year-old boy with osteosarcoma of the right upper humerus shows an enhancing tumor involving the shoulder joint. Enneking stage IIB. 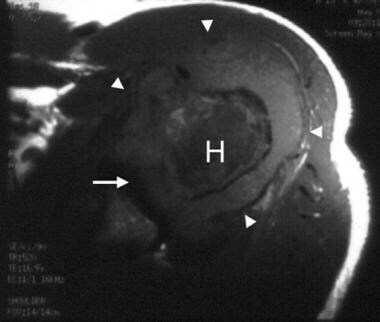 Prechemotherapeutic, T1-weighted, axial magnetic resonance image in a 19-year-old man with B-cell lymphoma of the left humeral head shows a low–signal-intensity tumor involving the left humeral head (H). A soft-tissue mass surrounds the humeral head (arrowheads), with involvement of the glenohumeral joint (arrow). Enneking stage IIB. Postchemotherapeutic, T1-weighted, axial magnetic resonance image shows that the humeral head has regained normal signal intensity (H). Resolution of the soft-tissue mass is almost complete. No glenohumeral joint involvement is present at this time. Enneking stage IIA. After chemotherapy, a poor tumor response with no reduction in tumor size usually indicates a poor histologic response; however, a substantial reduction in tumor size does not necessarily indicate a good prognosis. In most patients with Ewing sarcoma, a marked decrease in tumor size is an expected finding. MRI findings of residual soft-tissue components and tumor volume are usually correlated with the histologic response of the tumor to chemotherapy. Tumors that decreased in size by 25% and 75% after chemotherapy have a substantial overlap between good responses and poor responses. The intravenous administration of Gd-DTPA helps in differentiating remnant tumor from nontumorous tissue. Because of its greater vascularization, tumor tissue enhances more than does nontumorous tissue. However, the presence of vascularized granulation tissue, neovascularity in necrotic areas, or reactive hyperemia also may cause Gd-DTPA enhancement on static MRIs, making tumor-free tissue difficult to differentiate from tumor tissue. Dynamic, contrast-enhanced magnetic resonance images are better than static images for determining a tumor's response to chemotherapy (see the images below). Images in patients who respond well to chemotherapy show a reduction in enhancement, whereas those of patients who respond poorly show little or no reduction. Images should be acquired by using short time intervals because reactive changes may show contrast enhancement indistinguishable from that of tumor in the later phases of enhancement. Osteosarcoma of the left upper humerus. 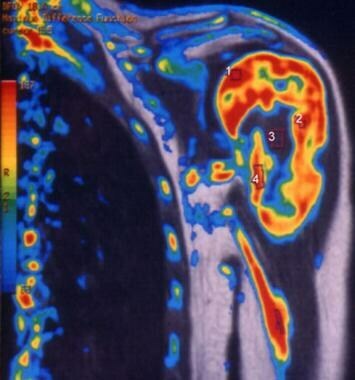 Contrast-enhanced, dynamic, coronal, color magnetic resonance image shows the degrees of enhancement of the tumor at different regions of interest (1-4). Enneking stage IIB. Dynamic time-intensity curves show a steep uptake of contrast material in the region of the viable tumor. A nonviable tumor shows a gradual gradient of contrast agent uptake. Parametric first-pass imaging and subtraction MRI have been used to increase the detection of early arterial enhancement of residual viable tumor. The use of magnetic resonance spectroscopy with phosphorus-31 in assessing changes in tumor metabolism and in monitoring changes in spectra has been evaluated. There are still limitations to this technique because of the difficulty of obtaining representative spectra in all locations in the tumor, the contamination of tumor spectra with phosphorus in adjacent soft tissues, and the technique's insensitivity to tumor heterogeneity. The differentiation between tumor recurrence and chronic posttherapeutic changes remains a difficult challenge. In general, recurrence is suggested when T1-weighted imaging demonstrates a hypointense lesion, which then enhances after Gd-DTPA administration and appears hyperintense on T2-weighted images. Chronic, posttherapeutic changes in a nonnodular lesion have low to intermediate signal intensity on T1-weighted images and lack high signal intensity on T2-weighted images. Static, contrast-enhanced MRI may not always be helpful in distinguishing recurrent tumors from posttherapeutic changes because the latter may also show enhancement after the administration of Gd-DTPA. Dynamic, contrast-enhanced MRI may be beneficial by demonstrating early enhancement in tumor tissue that is not seen in posttherapeutic changes. Fatty marrow may reconvert to hemopoietic marrow in children with osteosarcoma who have been treated with chemotherapy and granulocytic colony-stimulating factor. When such reconversion occurs in a patient, the marrow's appearance on magnetic resonance images may resemble that of a recurrent tumor, although reconverted marrow usually appears bilateral and symmetric. The reconverted marrow's signal intensity is similar to that of skeletal muscle, unlike the signal-intensity characteristics of a recurrent tumor. Tumor recurrence may be hard to detect when orthopedic implants are in close proximity to tumor sites. Orthopedic implants may cause susceptibility artifacts, making evaluation of the surrounding tissues difficult. Susceptibility artifacts occur at interfaces of structures with markedly different magnetic susceptibilities. Pure titanium orthopedic implants are nonferromagnetic, whereas some alloys are ferromagnetic. Susceptibility artifacts may be decreased by optimally positioning patients with orthopedic implants, by switching the orientation of the frequency- and phase-encoding gradients, by using the smallest voxel size, and by choosing fast spin-echo sequences. Susceptibility artifacts are more severe in gradient-echo sequences and in sequences with a long echo time. Radionuclide bone scans are commonly obtained by using technetium-99m (99mTc)–labeled diphosphonate to stage bone tumors. Disarticulation of the right shoulder was performed in this patient with right humeral osteosarcoma. 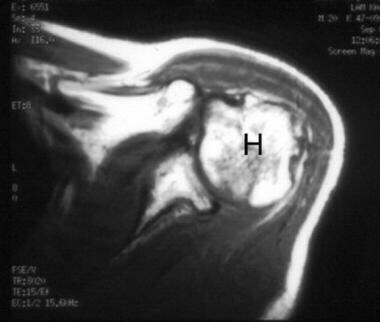 A radionuclide bone scan obtained 5 months after surgery shows abnormal focal areas of increased tracer uptake in the right scapula, left upper humerus, and right distal femur (arrows). These uptake areas correspond to bony metastases. Abnormal areas of increased tracer uptake are seen in the lungs, corresponding to pulmonary metastases (arrowheads). Enneking stage III. Areas showing increased tracer uptake in the skeleton should be evaluated by using radiography. Further evaluation with CT scanning or MRI may be necessary if plain radiographic findings are negative. Biopsy may be necessary if a positive result might change the patient's treatment. Soft-tissue masses and the soft-tissue components of bony tumors may be visualized by using ultrasonography (US). The histologic diagnosis of the lesions usually cannot be made by using US. The aim of US in the evaluation of musculoskeletal lesions is to confirm the presence of a lesion, to determine if the lesion is cystic or solid, to assess the relationship of the mass to the surrounding structures (eg, neurovascular bundle), to evaluate the vascularity of the mass, and to guide interventional procedures if indicated. Although color Doppler ultrasonographic evaluation of the mass is unreliable in determining the histologic diagnosis of the lesion and whether the lesion is benign or malignant, color Doppler US is a useful tool for monitoring the regression of tumor neovascularity induced by therapy in patients with musculoskeletal sarcoma. When the clinical findings suggest the recurrence of a soft-tissue sarcoma, US can be used as the initial imaging technique for evaluation. US can also be used in addition to MRI when susceptibility artifacts secondary to orthopedic hardware (including prostheses) prevent the evaluation of specific areas. Currently, angiography is used only occasionally to evaluate neurovascular bundle involvement. Its role has largely been replaced by cross-sectional imaging modalities. 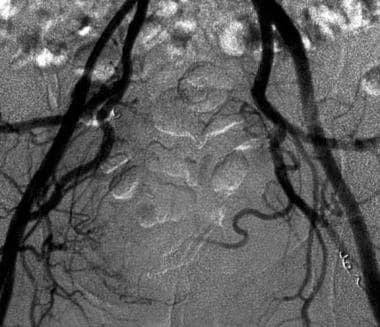 Angiography still has a postoperative role in decreasing hemorrhage through the embolization of tumor-supplying vessels (see the images below). Pre-embolization, bilateral iliac angiogram in a 51-year-old man with sacral chordoma shows tumor hypervascularity (arrows). Image courtesy of Austin MM Htoo, FRCP, FRCR. 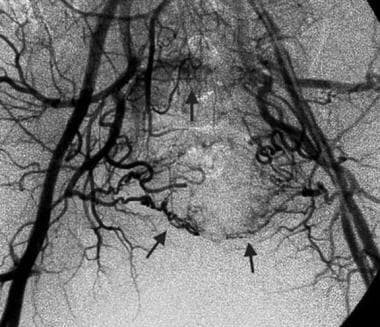 Postembolization angiogram shows a reduction of tumor vascularity. The embolization was performed using Gelfoam and coils. Image courtesy of Austin MM Htoo, FRCP, FRCR. These photons are detected by the PET scanner and reconstructed into a 3-dimensional image. Tumor metabolism is higher than that of normal tissue and shows higher FDG uptake. In bone tumors, the degree of FDG uptake is related to the histologic grade of the tumor. However, increased FDG uptake in a tumor does not necessarily indicate malignancy, because increased uptake can also be seen in benign bone lesions, such as nonossifying fibromas, fibrous dysplasia, giant cell tumors, eosinophilic granulomas, and aneurysmal bone cysts. PET has been shown to have a sensitivity similar to that of serial CT scanning and MRI for detecting lesions and for distinguishing postsurgical scarring from recurrent tumors. However, the specificity of PET is higher than that of serial CT scanning or MRI. In evaluating musculoskeletal sarcomas, when it comes to detecting recurrent tumor, FDG-PET scanning has higher sensitivity and specificity, as well as a greater positive and negative predictive value, than does iodine-131-meta-iodobenzylguanidine (MIBG) scanning. In summary, PET scanning appears to be better than CT scanning and MRI in depicting residual or recurrent tumor after treatment. The main disadvantage of PET scanning is the high cost of the equipment, which limits the modality's availability. Image-guided biopsy is less expensive and safer than open biopsy. The biopsy site should be located where the needle tract will be excised in future surgery, because of possible tumor seeding along the needle tract. Fluoroscopy with C-arm guidance, CT scanning, and MRI can be used to locate the most appropriate biopsy site. The primary advantage to fluoroscopy is its ability to create dynamic images. Biopsy of a vertebral body tumor. A 17-gauge bone-cutting needle is inserted through the left T11 pedicle (arrow). For aspiration cytology, a fine-gauge needle is used. For a lesion that predominantly consists of soft-tissue components, a cutting needle is usually chosen. For bone tumors, a combined trephine and cutting needle is utilized. The needle tract should pass through the bony and soft-tissue components of the tumor, allowing for complete histologic examination. Hemorrhage, infection, and trauma to surrounding tissues are complications of biopsy. Imaging plays a crucial role in staging bone tumors. Radiography, occasionally with the aid of CT scanning, is required for the detection and diagnosis of bone tumors. CT scanning and bone scintigraphy are useful in depicting pulmonary metastases and the multiplicity of lesions, respectively. MRI is the modality of choice in staging bone tumors because it can accurately depict the local spread of tumor to surrounding tissues. Contrast-enhanced MRI may be helpful in detecting viable posttreatment tumors. Manaster BJ, Ensign MF. Imaging of musculoskeletal tumors. Semin Oncol. 1991 Apr. 18(2):140-9. [Medline]. Olson PN, Everson LI, Griffiths HJ. Staging of musculoskeletal tumors. Radiol Clin North Am. 1994 Jan. 32(1):151-62. [Medline]. Peh WC. The role of imaging in the staging of bone tumors. Crit Rev Oncol Hematol. 1999 Jul. 31(2):147-67. [Medline]. Peh WC, Gilula LA. Plain film approach to tumours and tumour-like conditions of bone. Br J Hosp Med. 1995 Dec 13-1996 Jan 16. 54(11):549-57. [Medline]. Peh WC, Shek TW, Wang SC, et al. Osteogenic sarcoma with skeletal muscle metastases. Skeletal Radiol. 1999 May. 28(5):298-304. [Medline]. van der Woude HJ, Bloem JL, Hogendoorn PC. Preoperative evaluation and monitoring chemotherapy in patients with high-grade osteogenic and Ewing's sarcoma: review of current imaging modalities. Skeletal Radiol. 1998 Feb. 27(2):57-71. [Medline]. Velchik MG, Wegener W. Osteogenic sarcoma with pulmonary metastasis visualized by bone imaging. Clin Nucl Med. 1989 Sep. 14(9):662-5. [Medline]. Sherman CE, O'Connor MI. Musculoskeletal tumor imaging: an orthopedic oncologist perspective. Semin Musculoskelet Radiol. 2013 Apr. 17(2):221-6. [Medline]. Kransdorf MJ, Bridges MD. Current developments and recent advances in musculoskeletal tumor imaging. Semin Musculoskelet Radiol. 2013 Apr. 17(2):145-55. [Medline]. Fisher SM, Joodi R, Madhuranthakam AJ, Öz OK, Sharma R, Chhabra A. Current utilities of imaging in grading musculoskeletal soft tissue sarcomas. Eur J Radiol. 2016 Jul. 85 (7):1336-44. [Medline]. Cohen IJ, Hadar H, Schreiber R, et al. Primary bone tumor resectability: the value of serial MRI studies in the determination of the feasibility, timing, and extent of tumor resection. J Pediatr Orthop. 1994 Nov-Dec. 14(6):781-7. [Medline]. Enneking WF, Spanier SS, Goodman MA. A system for the surgical staging of musculoskeletal sarcoma. Clin Orthop Relat Res. 1980 Nov-Dec. (153):106-20. [Medline]. Enneking WF. A system of staging musculoskeletal neoplasms. Clin Orthop Relat Res. 1986 Mar. (204):9-24. [Medline]. Staging of musculoskeletal neoplasms. Musculoskeletal Tumor Society. Skeletal Radiol. 1985. 13(3):183-94. [Medline]. Nogueira Drumond JM. EFFICACY OF THE ENNEKING STAGING SYSTEM IN RELATION TO TREATING BENIGN BONE TUMORS AND TUMOR-LIKE BONE LESIONS. Rev Bras Ortop. 2010 Jan. 45 (1):46-52. [Medline]. Massengill AD, Seeger LL, Eckardt JJ. The role of plain radiography, computed tomography, and magnetic resonance imaging in sarcoma evaluation. Hematol Oncol Clin North Am. 1995 Jun. 9(3):571-604. [Medline]. Ashford RU, McCarthy SW, Scolyer RA, et al. Surgical biopsy with intra-operative frozen section. An accurate and cost-effective method for diagnosis of musculoskeletal sarcomas. J Bone Joint Surg Br. 2006 Sep. 88(9):1207-11. [Medline]. Skeletal Lesions Interobserver Correlation among Expert Diagnosticians (SLICED) Study Group. Reliability of histopathologic and radiologic grading of cartilaginous neoplasms in long bones. J Bone Joint Surg Am. 2007 Oct. 89(10):2113-23. [Medline]. Lodwick GS, Wilson AJ, Farrell C, et al. Determining growth rates of focal lesions of bone from radiographs. Radiology. 1980 Mar. 134(3):577-83. [Medline]. [Full Text]. Lodwick GS, Wilson AJ, Farrell C, et al. Estimating rate of growth in bone lesions: observer performance and error. Radiology. 1980 Mar. 134(3):585-90. [Medline]. [Full Text]. Sundaram M, McLeod RA. MR imaging of tumor and tumorlike lesions of bone and soft tissue. AJR Am J Roentgenol. 1990 Oct. 155(4):817-24. [Medline]. [Full Text]. Sundaram M, McGuire MH. Computed tomography or magnetic resonance for evaluating the solitary tumor or tumor-like lesion of bone?. Skeletal Radiol. 1988. 17(6):393-401. [Medline]. Panicek DM, Gatsonis C, Rosenthal DI, et al. CT and MR imaging in the local staging of primary malignant musculoskeletal neoplasms: report of the Radiology Diagnostic Oncology Group. Radiology. 1997 Jan. 202(1):237-46. [Medline]. [Full Text]. Apostolova I, Gölcük E, Bohuslavizki KH, Buchert R, Brenner W. Impact of additional SPECT in bone scanning in tumor patients with suspected metastatic bone disease. Ann Nucl Med. 2009 Dec. 23(10):869-75. [Medline]. Gillespy T 3rd, Manfrini M, Ruggieri P, et al. Staging of intraosseous extent of osteosarcoma: correlation of preoperative CT and MR imaging with pathologic macroslides. Radiology. 1988 Jun. 167(3):765-7. [Medline]. [Full Text]. Peh WC, Chan JH. Artifacts in musculoskeletal magnetic resonance imaging: identification and correction. Skeletal Radiol. 2001 Apr. 30(4):179-91. [Medline]. Onikul E, Fletcher BD, Parham DM, et al. Accuracy of MR imaging for estimating intraosseous extent of osteosarcoma. AJR Am J Roentgenol. 1996 Nov. 167(5):1211-5. [Medline]. [Full Text]. Tehranzadeh J, Mnaymneh W, Ghavam C, et al. Comparison of CT and MR imaging in musculoskeletal neoplasms. J Comput Assist Tomogr. 1989 May-Jun. 13(3):466-72. [Medline]. Berquist TH. Magnetic resonance imaging of musculoskeletal neoplasms. Clin Orthop Relat Res. 1989 Jul. (244):101-18. [Medline]. Berquist TH. 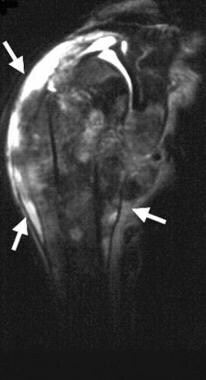 Magnetic resonance imaging of primary skeletal neoplasms. Radiol Clin North Am. 1993 Mar. 31(2):411-24. [Medline]. Pui MH, Chang SK. Comparison of inversion recovery fast spin-echo (FSE) with T2-weighted fat-saturated FSE and T1-weighted MR imaging in bone marrow lesion detection. Skeletal Radiol. 1996 Feb. 25(2):149-52. [Medline]. Shuman WP, Patten RM, Baron RL, et al. Comparison of STIR and spin-echo MR imaging at 1.5 T in 45 suspected extremity tumors: lesion conspicuity and extent. Radiology. 1991 Apr. 179(1):247-52. [Medline]. [Full Text]. Lang P, Grampp S, Vahlensieck M, et al. Primary bone tumors: value of MR angiography for preoperative planning and monitoring response to chemotherapy. AJR Am J Roentgenol. 1995 Jul. 165(1):135-42. [Medline]. [Full Text]. Geirnaerdt MJ, Bloem JL, Eulderink F, et al. Cartilaginous tumors: correlation of gadolinium-enhanced MR imaging and histopathologic findings. Radiology. 1993 Mar. 186(3):813-7. [Medline]. [Full Text]. Verstraete KL, De Deene Y, Roels H, et al. Benign and malignant musculoskeletal lesions: dynamic contrast-enhanced MR imaging--parametric "first-pass" images depict tissue vascularization and perfusion. Radiology. 1994 Sep. 192(3):835-43. [Medline]. [Full Text]. Varma DG, Ayala AG, Carrasco CH, et al. Chondrosarcoma: MR imaging with pathologic correlation. Radiographics. 1992 Jul. 12(4):687-704. [Medline]. [Full Text]. Zimmer WD, Berquist TH, McLeod RA, et al. Bone tumors: magnetic resonance imaging versus computed tomography. Radiology. 1985 Jun. 155(3):709-18. [Medline]. [Full Text]. Erlemann R, Reiser MF, Peters PE, et al. Musculoskeletal neoplasms: static and dynamic Gd-DTPA--enhanced MR imaging. Radiology. 1989 Jun. 171(3):767-73. [Medline]. [Full Text]. De Beuckeleer LH, De Schepper AM, Ramon F. Magnetic resonance imaging of cartilaginous tumors: is it useful or necessary?. Skeletal Radiol. 1996 Feb. 25(2):137-41. [Medline]. De Beuckeleer LH, De Schepper AM, Ramon F, et al. 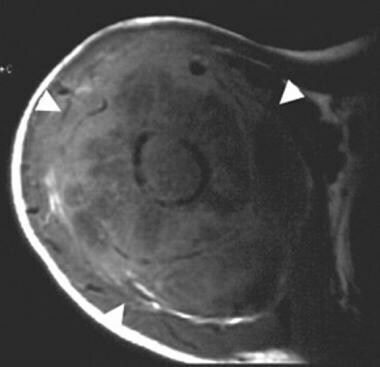 Magnetic resonance imaging of cartilaginous tumors: a retrospective study of 79 patients. Eur J Radiol. 1995 Nov. 21(1):34-40. [Medline]. Janzen L, Logan PM, O'Connell JX, et al. Intramedullary chondroid tumors of bone: correlation of abnormal peritumoral marrow and soft-tissue MRI signal with tumor type. Skeletal Radiol. 1997 Feb. 26(2):100-6. [Medline]. van der Woude HJ, Bloem JL, Verstraete KL, et al. Osteosarcoma and Ewing''s sarcoma after neoadjuvant chemotherapy: value of dynamic MR imaging in detecting viable tumor before surgery. AJR Am J Roentgenol. 1995 Sep. 165(3):593-8. [Medline]. [Full Text]. Bloem JL, Taminiau AH, Eulderink F, et al. Radiologic staging of primary bone sarcoma: MR imaging, scintigraphy, angiography, and CT correlated with pathologic examination. Radiology. 1988 Dec. 169(3):805-10. [Medline]. [Full Text]. de Baere T, Vanel D, Shapeero LG, et al. Osteosarcoma after chemotherapy: evaluation with contrast material-enhanced subtraction MR imaging. Radiology. 1992 Nov. 185(2):587-92. [Medline]. [Full Text]. Erlemann R, Sciuk J, Bosse A, et al. Response of osteosarcoma and Ewing sarcoma to preoperative chemotherapy: assessment with dynamic and static MR imaging and skeletal scintigraphy. Radiology. 1990 Jun. 175(3):791-6. [Medline]. [Full Text]. Fletcher BD. Response of osteosarcoma and Ewing sarcoma to chemotherapy: imaging evaluation. AJR Am J Roentgenol. 1991 Oct. 157(4):825-33. [Medline]. [Full Text]. Fletcher BD, Hanna SL, Fairclough DL, et al. Pediatric musculoskeletal tumors: use of dynamic, contrast-enhanced MR imaging to monitor response to chemotherapy. Radiology. 1992 Jul. 184(1):243-8. [Medline]. [Full Text]. Lang P, Honda G, Roberts T, et al. Musculoskeletal neoplasm: perineoplastic edema versus tumor on dynamic postcontrast MR images with spatial mapping of instantaneous enhancement rates. Radiology. 1995 Dec. 197(3):831-9. [Medline]. [Full Text]. Lemmi MA, Fletcher BD, Marina NM, et al. Use of MR imaging to assess results of chemotherapy for Ewing sarcoma. AJR Am J Roentgenol. 1990 Aug. 155(2):343-6. [Medline]. [Full Text]. MacVicar AD, Olliff JF, Pringle J, et al. Ewing sarcoma: MR imaging of chemotherapy-induced changes with histologic correlation. Radiology. 1992 Sep. 184(3):859-64. [Medline]. [Full Text]. Boyko OB, Cory DA, Cohen MD, et al. MR imaging of osteogenic and Ewing''s sarcoma. AJR Am J Roentgenol. 1987 Feb. 148(2):317-22. [Medline]. [Full Text]. Holscher HC, Bloem JL, Vanel D, et al. Osteosarcoma: chemotherapy-induced changes at MR imaging. Radiology. 1992 Mar. 182(3):839-44. [Medline]. [Full Text]. Ryan SP, Weinberger E, White KS, et al. MR imaging of bone marrow in children with osteosarcoma: effect of granulocyte colony-stimulating factor. AJR Am J Roentgenol. 1995 Oct. 165(4):915-20. [Medline]. [Full Text]. Arrington ER, Eisenberg B, Orrison WW Jr, et al. Scintigraphic appearance of uncommon soft-tissue osteogenic sarcoma metastases. J Nucl Med. 1990 May. 31(5):679-81. [Medline]. [Full Text]. Brady AP, Ennis JT. 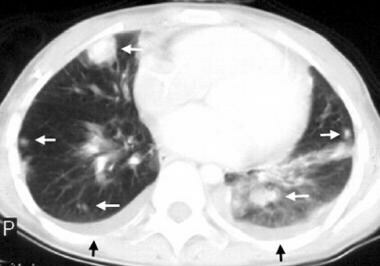 The scintigraphic detection of ossific mediastinal and pulmonary metastases in osteosarcoma. Br J Radiol. 1990 Dec. 63(756):978-80. [Medline]. Nakajo M, Nakajo M, Jinguji M, Fukukura Y, Nakabeppu Y, Tani A, et al. The value of intratumoral heterogeneity of (18)F-FDG uptake to differentiate between primary benign and malignant musculoskeletal tumours on PET/CT. Br J Radiol. 2015. 88 (1055):20150552. [Medline]. Van der Woude HJ, Vanderschueren G. Ultrasound in musculoskeletal tumors with emphasis on its role in tumor follow-up. Radiol Clin North Am. 1999 Jul. 37(4):753-66. [Medline]. Garcia R, Kim EE, Wong FC. Comparison of fluorine-18-FDG PET and technetium-99m-MIBI SPECT in evaluation of musculoskeletal sarcomas. J Nucl Med. 1996 Sep. 37(9):1476-9. [Medline]. [Full Text]. Griffeth LK, Dehdashti F, McGuire AH, et al. PET evaluation of soft-tissue masses with fluorine-18 fluoro-2-deoxy-D-glucose. Radiology. 1992 Jan. 182(1):185-94. [Medline]. [Full Text]. Korkmaz M, Kim EE, Wong F. FDG and methionine PET in differentiation of recurrent or residual musculoskeletal sarcomas from post-therapy changes. J Nucl Med. 1994. 34:33P. Schulte M, Brecht-Krauss D, Heymer B. Grading of tumors and tumorlike lesions of bone: evaluation by FDG PET. J Nucl Med. 2000 Oct. 41(10):1695-701. [Medline]. Adler LP, Blair HF, Williams RP. Grading liposarcomas with PET using [18F]FDG. J Comput Assist Tomogr. 1990 Nov-Dec. 14(6):960-2. [Medline]. Kern KA, Brunetti A, Norton JA. Metabolic imaging of human extremity musculoskeletal tumors by PET. J Nucl Med. 1988 Feb. 29(2):181-6. [Medline]. [Full Text]. Chang CY, Gill CM, Joseph Simeone F, Taneja AK, Huang AJ, Torriani M, et al. Comparison of the diagnostic accuracy of 99 m-Tc-MDP bone scintigraphy and 18 F-FDG PET/CT for the detection of skeletal metastases. Acta Radiol. 2016 Jan. 57 (1):58-65. [Medline]. Bischoff M, Bischoff G, Buck A, von Baer A, Pauls S, Scheffold F, et al. Integrated FDG-PET-CT: its role in the assessment of bone and soft tissue tumors. Arch Orthop Trauma Surg. 2009 Jul 28. [Medline]. Trieu J, Schlicht SM, Choong PF. Diagnosing musculoskeletal tumours: How accurate is CT-guided core needle biopsy?. Eur J Surg Oncol. 2016 Mar 2. [Medline].